HRANA News Agency – In women’s ward of Evin prison, there are many mothers who are imprisoned with political and security charges. They are being kept in an inappropriate condition and without having sufficient phone call time, and very limited visits. The condition of this ward resulted in spreading of women and different diseases among the prisoners. 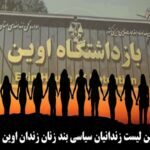 HRANA News Agency – In the women’s ward of Evin prison where many mothers are being kept, it is not possible to make a phone call, visits are limited and there are many environmental problems in this place. This report gives the names, status and charges of 31 female political-security prisoners.